Thank you for my new Raspberry Pi, Santa! What next? Note: the Pi Towers team have peeled away from their desks to spend time with their families over the festive season, and this blog will be quiet for a while as a result. We’ll be back in the New Year with a bushel of amazing projects, awesome resources, and much merriment and fun times. Happy holidays to all! Now back to the matter at hand. Your brand new Christmas Raspberry Pi. 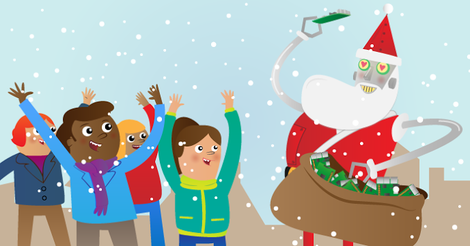 Did you wake up this morning to find a new Raspberry Pi under the tree? Congratulations, and welcome to the Raspberry Pi community! You’re one of us now, and we’re happy to have you on board. But what if you’ve never seen a Raspberry Pi before? What are you supposed to do with it? What’s all the fuss about, and why does your new computer look so naked? Are you comfy? Good. Then let us begin. First of all, you need to make sure you have an operating system on your micro SD card: we suggest Raspbian, the Raspberry Pi Foundation’s official supported operating system. If your Pi is part of a starter kit, you might find that it comes with a micro SD card that already has Raspbian preinstalled. If not, you can download Raspbian for free from our website. An easy way to get Raspbian onto your SD card is to use a free tool called Etcher. Watch The MagPi’s Lucy Hattersley show you what you need to do. You can also use NOOBS to install Raspbian on your SD card, and our Getting Started guide explains how to do that. Your new Raspberry Pi 3 comes with four USB ports and an HDMI port. These allow you to plug in a keyboard, a mouse, and a television or monitor. If you have a Raspberry Pi Zero, you may need adapters to connect your devices to its micro USB and micro HDMI ports. Both the Raspberry Pi 3 and the Raspberry Pi Zero W have onboard wireless LAN, so you can connect to your home network, and you can also plug an Ethernet cable into the Pi 3. Make sure to plug the power cable in last. There’s no ‘on’ switch, so your Pi will turn on as soon as you connect the power. Raspberry Pi uses a micro USB power supply, so you can use a phone charger if you didn’t receive one as part of a kit. If you’ve never used a Raspberry Pi before, or you’re new to the world of coding, the best place to start is our projects site. It’s packed with free projects that will guide you through the basics of coding and digital making. You can create projects right on your screen using Scratch and Python, connect a speaker to make music with Sonic Pi, and upgrade your skills to physical making using items from around your house. Explore the world of Raspberry Pi physical computing with our free FutureLearn courses: http://rpf.io/futurelearn Free make your own Whoopi Cushion resource: http://rpf.io/whoopi For more information on Raspberry Pi and the charitable work of the Raspberry Pi Foundation, including Code Club and CoderDojo, visit http://rpf.io Our resources are free to use in schools, clubs, at home and at events. You’ve plundered our projects, you’ve successfully rigged every chair in the house to make rude noises, and now you want to dive deeper into digital making. Good! While you’re digesting your Christmas dinner, take a moment to skim through the Raspberry Pi blog for inspiration. You’ll find projects from across our worldwide community, with everything from home automation projects and retrofit upgrades, to robots, gaming systems, and cameras. You’ll also find bucketloads of ideas in The MagPi magazine, the official monthly Raspberry Pi publication, available in both print and digital format. You can download every issue for free. If you subscribe, you’ll get a Raspberry Pi Zero W to add to your new collection. HackSpace magazine is another fantastic place to turn for Raspberry Pi projects, along with other maker projects and tutorials. And, of course, simply typing “Raspberry Pi projects” into your preferred search engine will find thousands of ideas. Sites like Hackster, Hackaday, Instructables, Pimoroni, and Adafruit all have plenty of fab Raspberry Pi tutorials that they’ve devised themselves and that community members like you have created. If you make something marvellous with your new Raspberry Pi – and we know you will – don’t forget to share it with us! Our Twitter, Facebook, Instagram and Google+ accounts are brimming with chatter, projects, and events. And our forums are a great place to visit if you have questions about your Raspberry Pi or if you need some help. It’s good to get together with like-minded folks, so check out the growing Raspberry Jam movement. Raspberry Jams are community-run events where makers and enthusiasts can meet other makers, show off their projects, and join in with workshops and discussions. Find your nearest Jam here. Have a great festive holiday and welcome to the community. We’ll see you in 2018! seems a bit dated. A cell phone charger may work with the B+, but there are few that work reliably with the 3B and latest 2B. At any rate, to all those who have received a Pi on Christmas Day, congratulations, you now have a device that can be used to learn anything from elementary programming and digital electronics to scientific computing, networking, deep learning, data mining and many other topics covered by current buzzwords in science, technology, engineering and mathematics. If you didn’t get a Pi and if I remember correctly the song: On the eleventh day of Christmas my turtle dove gave to me eleven Pi’s piping and a partridge in a pear tree. There is always something to look forward to somewhere in the future. It eouldnt be enough electricity for the Raspberry Pi. It would have to give more then 5V which normal power supply for Handys give. No,I run my Pi off a double USB power adapter. 1 amp for the ChromeCast and one amp for the Pi. Mine is a Raspberry Pi 3 (model B) and it runs perfectly. With your shiny new Pi3 in hand… Google Retropie. Your life will never be the same… good luck. But instead of spending money on retro consoles, I have Lakka! I might be 40… but I started out on the TRS-80 Color Computer (that would be the Dragon to y’all over across the pond)… speaking of which, some people actually have gotten a working MAME emulator (a few CoCo nuts, nonetheless) that runs MAME smoothly and at full speed on a Raspberry Pi. They got MAME working… all just to scratch a personal itch. To run Color Computer/Dragon emulation on the Raspberry Pi. That’s the beauty of learning to program. The beauty of finding out that a computer is something more than just to check Facebook on. But I’m one happy person! The browser is a bit laggy though. . . Somewhat expected for a computer worth $35 but still exceptional! Solar3000 talks about the Pi3.5 and the Pi4. “A cell phone charger may work with the B+, but there are few that work reliably with the 3B and latest 2B.” Quite right! Before we start taking about Pi 3.5 or Pi 4, we need to put a stop to this absolute silliness. There never was a decent excuse for a “Raspberry Pi 5V Standard that’s not 5V”. I can’t imagine the terrors of trying to get a Pi-compatible power supply in a third world country, but it would have to be the main deterrent to buying a Pi in the first place. C’mon guys and gals, how about a touch of professionalism on this issue. Got one for Christmas, so excited….it doesn’t boot. So its back to the Santa for a warranty claim and dashed hopes. The vast majority of boot problems are issues with the SD card or power supply; it is rare for a board to be faulty. Try reflashing the SD card with the latest version of Rasbian downloaded from this site, and make sure you are using a power supply that can supply at least 2 amps. To add to what Simon has said 99.999999% of all non-booting problems are due to invalid contents on the SDCard. It is the number one most frequently asked question on the forums. So much so that there’s a number of “sticky” threads on https://www.raspberrypi.org/forums/viewforum.php?f=28 to help the folks with non-booting RPis to get them working. There’s also lots of stuff for the newbies in https://www.raspberrypi.org/magpi-issues/MagPi65.pdf starting on page 16. Best of luck trying to build a fresh SDCard, it’s going to be easier than the ugly return/replacement game of snakes and ladders. Got my new Pi3, formatted the SD and downloaded Raspbian. Plugged it in and held my breath. It booted right up! Let the fun begin! Normal power adapters for Handys give 5V. That isnt enough for the Raspberry Pi. All mobile phone power adapters give 5V (or up to 5.5V), as that is the USB standard. The issue is not the voltage, it is the maximum current the adapter can supply. Older adapters can only supply up to 1 amp; the Pi in its latest forms pulls 2 amps, so needs a newer adapter. Hi there. You can find your nearest Raspberry Pi Approved Reseller on our products page.